Fabric | Do-It-Yourself Advice Blog. If sprucing up the cabin in your boat is on your spring to-do list this year, this is the post for you. Recovering settee cushions, sewing cabin curtains, and adding colorful throw pillows are popular sewing projects. If you’re going to re-do your boat interior, it’s important to start with a game plan of which fabrics you’re going to use and the feel you want for your home aboard. Today we’ve rounded up three different cabin “looks” to help get your ideas flowing. 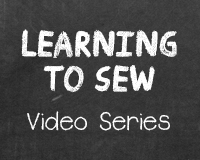 Before we get into the designs, we should take a moment to talk about fabric fiber choices. In a boat cabin you want the cushions to be comfortable but also to not allow mold and mildew to grow. To do this, avoid cotton fabrics and opt for acrylic, olefin or vinyl instead. You’ll also want to use a durable fabric for settee cushions and berths, but accents of occasional use outdoor fabrics are a fun way to bring in different colors and patterns. 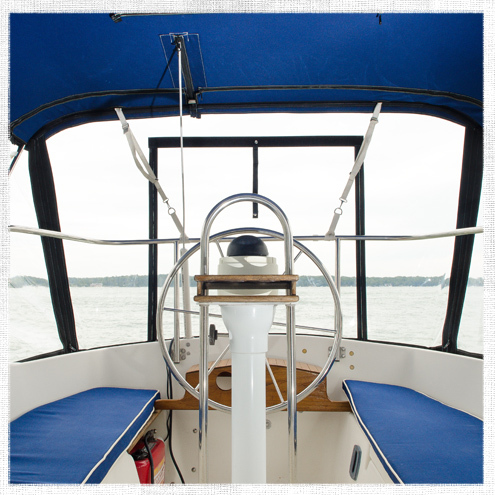 All of the recommendations we make in this post are fabrics that are appropriate for use in a boat cabin. A perennial favorite, the classic nautical color scheme and patterns are still the first choice of many boaters for their cabins. This includes traditional colors like true red, navy, royal blue and white. This looks remains a classic for a reason, these colors look great alongside a traditional teak and holly interior. Our look imagines using a traditional navy blue as a base color with added pops of a red fabric with a knot motif. The fabric with sailboats and burgees is also a playful nod to the sailing life. Boat cabins don’t always get a lot of natural light and with the abundance of wood finishes, they can sometimes feel dark. A great way to brighten up your saloon is to use a light-colored upholstery fabric on your settee cushions and other fabric finishes. A soft neutral like this Light Oyster Ultraleather (#1 in the image) makes a great base for cushions. Then, other colors can be brought in with throw pillows and other accessories. If solid beige isn’t your looks, think outside the box! 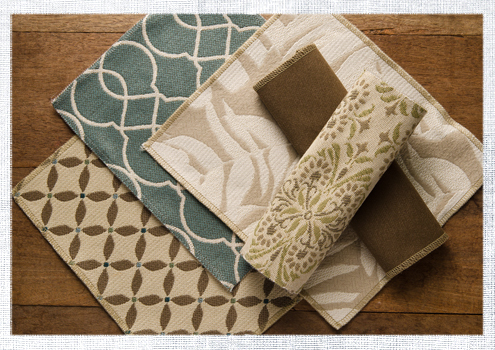 Neutrals don’t have to be solids; patterns in soft colors will also brighten your cabin. Also, gray is a great neutral with a modern feel. Another way to brighten up your cabin and infuse it with personality is to incorporate vibrant colors. Bring the colors of the Caribbean to your cabin with bright, tropical tones like in this popular Sunbrella fabric, Seville Seaside (#3 in the photo). Balance out your punchy colors with either a darker coordinate color like this dark navy or a light neutral like a beige as accent colors for curtains or pillows. You can find more fabrics for your cabin in these looks and many more at Sailrite.com. To read more about which types of fabric to use in your cabin, check out our Cockpit vs. Cabin Cushion Fabric Choices post. Which design idea is your favorite? Do you have any of these themes in your boat? Share your opinions and ideas in the comments. When you’re about to start an upholstery project, one of the first decisions you’ll need to make is which fabric to use. With all the options available it can be hard to know which fabric would be a good choice. You’ll obviously want to the take the color and style into account so your piece matches your home, but you should also consider if the fabric is strong enough to be stretched for upholstery and how the fabric will wear over time. I recently sat down with Cindi, our resident upholsterer, and asked her a few questions about what to consider when choosing an upholstery fabric. We turned our cameras on and made a short video to share with you, take a look! Let’s take another look at a few of the considerations we discussed in the video. What are the double rubs? Double rubs are an abrasion resistance measurement from a test called the Wyzenbeek Test. The test simulates people sitting on furniture by rubbing cotton duck over a fabric. Each pass forward and back is one double rub. For a family room, you’ll want to use a fabric with at least 15,000 double rubs. You can read more about double rubs in our post “Double Rubs and the Wyzenbeek Test“. Kids and pets are hard on furniture. If you have small children or pet that sits on the furniture you’ll want to look for a fabric that can stand up to a lot of wear and tear. A cleanable fabric like Sunbrella Upholstery, which is stain resistant and can be treated with bleach, would be a great choice for a family with messy kids. As Cindi says in the video, fabrics with a “hard finish” are good for pets. Look for fabrics that don’t have a loose weave or any fibers that could be pulled by claws. The example fabric from the video is P/Kaufmann Flash, which is an animal print fabric with a sateen feel and shine and a slick finish. Where is the piece in your house? Where the upholstered piece is going to live in your home and how you use that room is another important consideration to make. You want to choose a fabric with more double rubs that feels heftier for a family room, but you could pick a lighter, more delicate fabric for a formal living room that doesn’t see as much traffic. This could also influence your color choice. Darker colors will hide dirt better than lighter colors. When you’re ready to start your next re-upholstery project, head to Sailrite.com and browse our selection of upholstery fabrics. 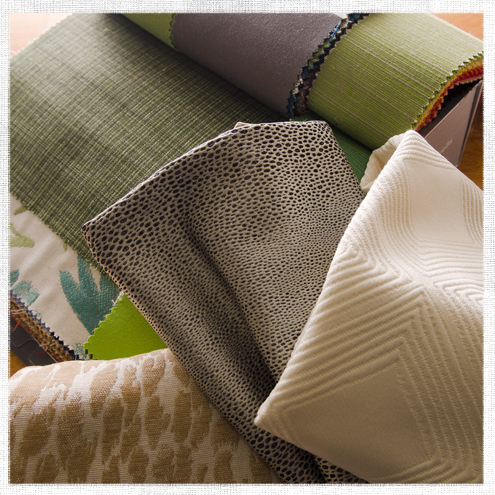 What is most important to you when choosing fabrics for your home? Share your experiences in the comments. Have you seen or heard about Geobella fabrics yet? We’re pretty excited about the possibilities of this fabric line. Geobella is made from 100% olefin yarns, which is known for having a wool-like feel. It’s a great choice for both inside and outside your home or inside your boat cabin. Today we’re sharing a few of Geobella’s best traits, so you can see the possibilities of this fabric, too. The name Geobella breaks down into two parts: “geo” meaning “earth” and “bella” meaning “beautiful.” That’s a great summation of what the makers of Geobella set out to do—create an eco-friendly fabric that’s also stylish. Geobella fabric is made from 100% recyclable yarns. In fact, olefin fibers, the material Geobella is made from, can be recycled up to 10 times! Olefin is a synthetic (man-made) fiber, but the process of making it is greener than other synthetic fibers. Extruding olefin creates virtually no by-product, resulting in very little waste. 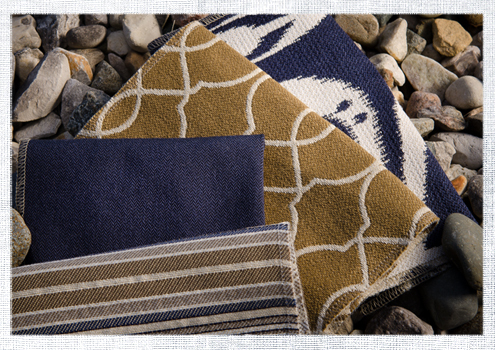 Geobella fabrics are extremely durable, both for use outside and inside your home. All Geobella fabrics are solution-dyed so they are incredibly colorfast down to their core. These fabrics are great for use near water like in boat cabins or pool areas because they are moisture wicking and quick drying. In addition, Geobella is resistant to bacteria, mold, mildew and odors. Geobella is also great for interior upholstery, especially for families with kids or pets. 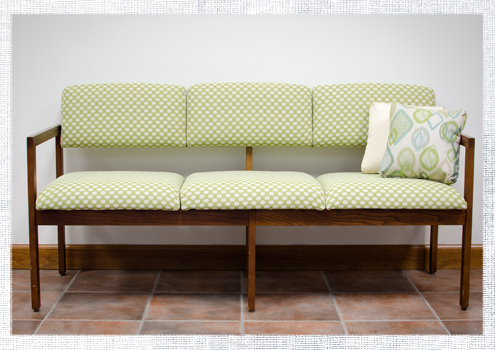 While Geobella has a rougher hand than most other upholstery fabrics, the tradeoff is its long-wearing durability. This fabric, as Matt Grant likes to say, “wears like iron.” Pet’s claws won’t easily tear the fibers of this fabric and spills clean up easily. In fact, you can clean Geobella with a 50/50 bleach and water solution and it won’t harm the fabric. Geobella fabrics are manufactured by the makers of Phifertex and Phifertex Plus and as such are an excellent compliment to those lines of fabric. Pairing Geobella pillows with Phifertex Plus sling chairs makes a really stylish poolside or patio set-up. For inside your home, Geobella’s predominantly neutral color scheme makes it easy to pair with other décor, so it can fit seamlessly into your existing décor. 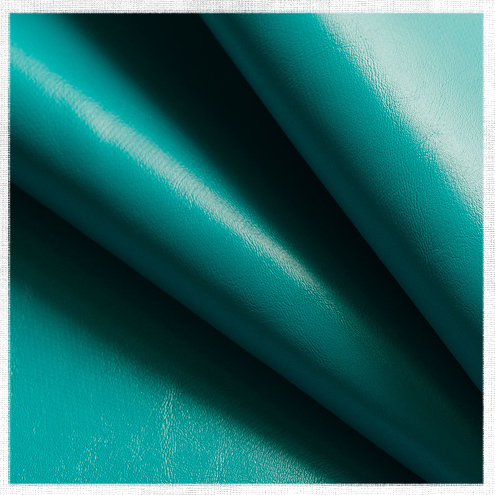 We recommend Geobella fabrics for boat interiors, outdoor cushions and patio furniture as well as cushions and upholstery in high-traffic areas of your home. 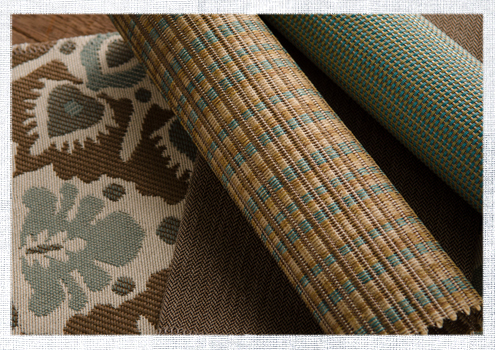 Here are just a few projects we think would look great with Geobella fabrics. Give Geobella a try for yourself! Sailrite carries Geobella Fabric in over 60 patterns and colorways. Have you ever sewn with Geobella? Share your experiences with this fabric line in the comments below. Surlast—Which Side is the Outside Surface? Surlast is one of our most popular fabrics. This solution dyed-polyester is great for a variety of cover applications from boat covers to patio furniture covers. It has a urethane coating on one side of the fabric that provides added stability, minimizes shrinking and stretching, and increases water and mildew resistance. The coated side should be the inside of the fabric when used in an application, but sometimes it can be really hard to tell the difference between the coated and uncoated sides. In fact, this is actually one of our most frequently asked questions! We made a quick video to show you an easy, fool-proof trick for determining which side is the inside, coated side and which is the outside, uncoated side. Ready for our tip? Sprinkle water on the fabric! The outside of the fabric will cause the water to bead up on the fabric’s surface while the inside will soak in the water more, just like in the photo above. This trick works on all Surlast fabrics, no matter the color. If you have older Surlast that has been out in the weather for a while you can restore this water resistance with 303 Fabric Guard. This easy to apply spray will make the top of your fabric repel water so it beads up and runs off your cover again. The video will also show you what a great job this product does at restoring water resistance. We recommend treating your Surlast whenever you notice water not beading and after each time the fabric is washed. See these tips in action in the video below. Learn more about Surlast fabric and if it would be right for your next cover project at Sailrite.com. Is this something you struggled with before? How did you figure out which side was which? Share your experiences in the comments! You spend a lot of time in your boat’s cockpit, so you naturally want the most comfort and function out of your cockpit cushions. We’ve already shared our video tutorial on how to make cockpit cushions, but today we’re going to follow up with an in-depth look at the pros and cons of the different materials you can use to put those cushions together. For the best performing cushions, the choice of which foam and fabric to use should influence each other. Let’s start by taking a look at foam. There are 3 types of foam we recommend for cockpit cushions: closed cell, polyurethane and Dry Fast foam. A common priority is cockpit cushions that will also float. If you want your cockpit cushions with floatation, you’ll want to use closed cell foam. Closed cell foam can be wrapped in just about any type of marine material, because the foam itself won’t soak up any water or moisture. Polyurethane foam is the standard for OEM boat manufacturers, but it soaks up water and takes a long time to dry out so we recommend covering the foam in vinyl. The waterproof vinyl will keep your foam nice and dry. The third option is Dry Fast foam, which is a very breathable foam and allows water to run through the cushion. We recommend using a breathable fabric like Sunbrella or a mesh fabric to accommodate this main feature of the foam. To learn more about theses different foam options to pick the one that’s best for your needs and tastes check out the second part of our Cushion Foam Series, 5 Types of Outdoor Cushion Foam. There are three main types of fabric that we recommend for cockpit cushions (vinyl, woven and mesh) and each has its pros and cons. Let’s break each choice down. The pros of vinyl are that it is waterproof, very durable, relatively inexpensive, and it’s the easiest of all three options to clean. We really like Morbern Seabrook Vinyl and Naugahyde Universal and All American vinyl for cockpit cushions applications. The Naugahyde brands cost a little bit more, but they feature a protective BeautyGuard finish that adds to their durability and is a big plus. The cons to vinyl are that it can be very hot to sit on and can have more of a plastic look than a woven fabric. 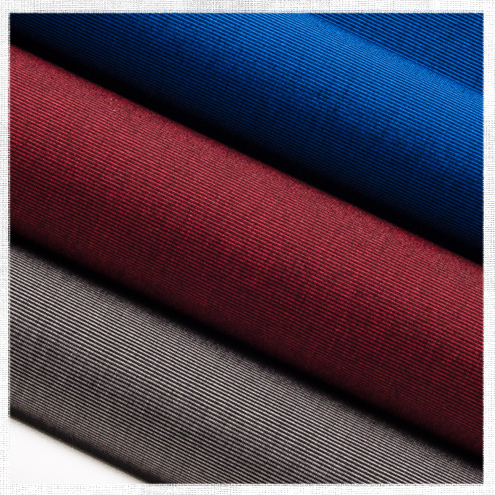 Woven fabrics offer a beautiful appearance with a true fabric look and are the softest to sit on. Woven fabrics are breathable and you’ll want to select one with water resistance for the demands of the application. 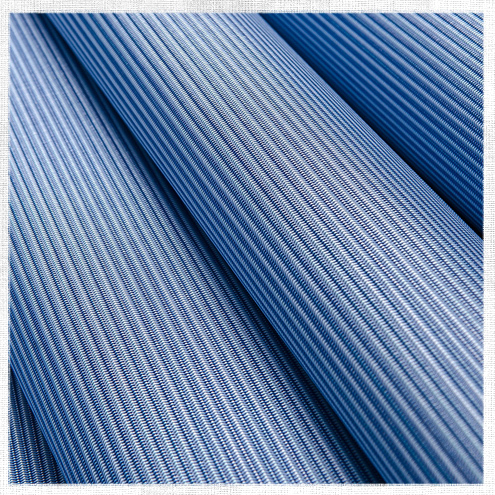 Sunbrella is our favorite brand for a woven cockpit cushion fabric as it’s breathable, durable, water and UV resistant and easy to clean. The drawbacks here are that woven fabrics are not as durable over time as vinyl or mesh and are not quite as easy to clean as vinyl. By mesh we mean fabrics like Phifertex and Phifertex Plus that are sturdy, vinyl meshes. These fabrics are ultra low maintenance and will last a long time. When used with the right foam, you can leave mesh cushions out in the rain with no worries. Because the mesh will not block any water from reaching the foam, this fabric should only be used with Dry Fast foam. The open weave of this fabric can also allow contaminates to reach the foam, which could shorten the lifespan of the foam. Mesh can be a little uncomfortable to sit on at times and can be trickier to clean than other options because you need to remove the foam before cleaning. You can always create cushions that use a combination of two fabrics, like using Sunbrella on the top of the cushions and then Phifertex Mesh on the bottom with Dry Fast foam. This gives you a comfy seat but allows great drainage for the Dry Fast. We like this approach, but it does eliminate your ability to flip the cushions, if this is something you do frequently. As you can see, there are several factors to consider before building new cockpit cushions and the right pairing of foam and fabric really depend on your preferences and how you like to use the cushions. We hope that now you have all the information you need to make an informed decision on what is best for you and your boat. Find all the foams and fabrics discussed here for your cockpit cushions at Sailrite.com. Have you made your own cockpit cushions before? 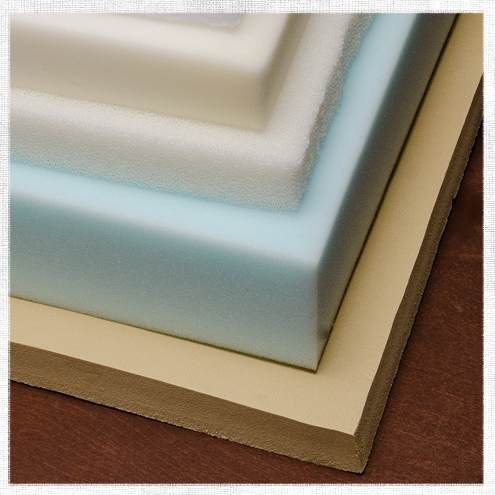 What foam and fabric combination did you use and why? Share your design decisions with us comments.